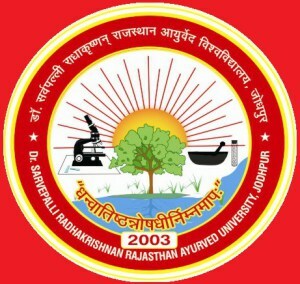 Dr. Sarvepali Radhakrishnan Rajasthan Ayurved University, Jodhpur is the first Ayurved University of Rajasthan and is the second University of it’s kind in India, The Dr. Sarvepali Radhakrishnan Ayurved University was established by DSRRAU Act -2002 (Act No. 15 of 2002) which came into force w.e.f. may 24, 2003 vide Gazette Notification no. F25 (6) Ay. /2000 dated May 24,2003. The RAU Jodhpur University offers AMS, BUMS, BHMS, BNYS, B.Sc (Ayurved Nursing), MD (Ayu. ), MD (Homoeo), Ph.D. (Ayurveda) and certain Diploma and Certificate courses are being conducted through its affiliated colleges.